I am about to make a move as far as employment goes. I'm an editor. I am not interested in editing for a company that offshores. I'd like to know who they are. If you are aware of any, please list them. Thanks. CORTIMEDICAL HAS CLIENTS THAT DO LIKE FOCUS INFOMATICS - Beware! Sten-Tel is bringing all of their offshore work back in to USA. Per the client's wishes! nm - Reality. Do NOT work as editor here, do NOT work here at all! - ! OSI OFFSHORES ! MTStars has been staunchly against the offshoring of American Private Health Information, but realizes that MTStars must evolve with the ever changing views of conducting business in the global economy. The hands of time cannot be turned back on the widespread transfer of information globally and as of January 1, 2006, MTStars opened itself up to include the global environment. I try not to keep companies going that offshore. A growing number of healthcare facilities have reduced costs significantly with our breakthrough transcription program. By eliminating the high labor-related inherent with traditional outsourcing, our SmartSourcing program will save you 25% or more. Diskriter is involved in Offshore Outsourcing (sending sensitive private health information of US citizens to countries such as India, Pakistan, Philippines, etc...). Need to start looking and need to know which companies to avoid...please share the names of companies who offshore. why would a client pay for US people to do the work when India can do it for much less? are MDI-MD and Landmark. Let's support American jobs for American workers. For anyone wanting to keep the work in the USA!!!!! Are there any companies that pay a good line rate and are good to there MTs that do not offshore there work? I am trying to help a friend looking for part time work, but she is staying clear of those that offshore..
post ads on MTStars. TM is not one of those companies. They are not an MT company, more like an employment agency. If a company pays to advertise on MTStars any post that doesn't glorify them is removed and evidently that is what happened. but I think some are just greedy and they want you to think that they must lower their rates to keep an account and that trickles down. I would look for those. I know for sure that Execuscribe, JLG, Keystrokes and MDI-MD do not send work out of the USA. I am sure that there are others. I forwarded the entire thread about an hour ago to my Lead Transcriptionist, HR and to the owner of the company I work for so that they are aware of Heartland doing this. The owner has already answered me and said that they will watch out for displaced Heartland MTs and give them special attention. She agrees that no one deserves this treatment. I am proud to be an MT, but discouraged and worried that things like this happening will chase away my fellow professionals. I hate to say it, but we really do need more structure if we are going to make a difference. She tries to hook you up with companies that offshore. NO thanks. say they don't, but they do. It is getting harder and harder to find a company that doesn't offshore, whether it be to India, the Phillipines, or Trinidad. If you have children to feed and a mortgage to pay you HAVE to work. Unless you've figured out a way to get the bills paid and not work you do what you have to do. Yes. I will not work for companies which offshore. If we all did that, the companies would have no choice but to come back and give us our jobs back. Is there a list of companies that DON'T OFFSHORE? If not, can we list them here? I'm tired of getting laid off or not having enough work from companies who're sending work to India. If you know of a company that doesn't offshore, it would also be nice if you could say whether or not they require VR. Thanks in advance to anyone who participates -- we're all in this together! Sometimes their actually hotel rooms. They use international phone numbers and purchase a phone # in the U.S. In point of fact, clients many times don't even know they are dealing with an offshore company. The owner of this website has done extensive reseach and knows who offshores and who doesn't. It isn't that hard to figure out when you start connecting the dots, i.e., visit the website and there is no place for MTs to apply. Almost all U.S. based companies have a place to apply. Notice that all the offices, including those in other states, all have the same address and phone number. And notice if you call that 24/7 phone number you always get a voice mail. There are lots of ways to tell. The offshoring companies are getting more sophisticated about how they work things. And some hospitals are getting more persistent about not contracting with services who are offshore. It's a shill game. Dishonest and deceitful. Is there an easier way to find out if companies offshore? I have worked for 3 companies that all offshored and were absolutely not forthcoming about it upfront. I never want to work for one again. Is there a list somewhere or am I banging my head on the wall. Again. How about this? In a nutshell, which companies DO NOT outsource OFFshore? I though offshore companies could not advertise on this site? Guess I am wrong about that. Inside the post she asked to start a second list of companies who keep work here in the USA. I understood the post, and was merely listing Keystrokes as someone who does NOT offshore to go on the second list of companies that keeps work here. KS does NOT offshore and they never will. WHOOPS, referring to companies who do not offshore. have very deep pockets and make it attractive for companies here to use them. 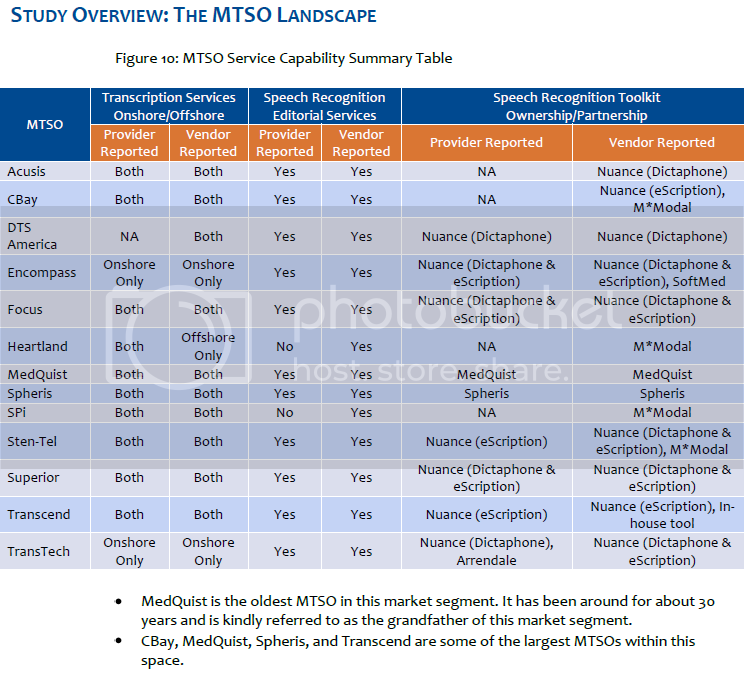 Even if every smaller MTSO refused to do it, do you think we would be able to compete with Spheris and C-Bay just to name two of the bigger companies that use the offshore transcriptionists? Hospitals, unfortuneately, often care more about the bottom line than the perfection we expect from ourselves. Many doctors do not read the reports (most from what I understand) and just care that they have satisfied JACHO requirements by having a record in the charts. Offshore transcription is not going anywhere. Sad but true. I do not support it but I am a small tree in a very, very, very big forest. Are there any companies left who don't send work offshore? Webmedx is in the $25m range with 750 employees and Keystrokes in the $20m range with 600 employees. I am not sure about SoftScript or Transtech but I do not think they are bigger than those two. I know that both have goals to be in the same size range as Spheris. I worked for Spheris in management for a while before coming to my senses and both companies were discussed frequently. I just hope that MQ or Accusis does not buy either of them. The rumor is that neither will even think of selling but $$$ talks and MQ still seems to have plenty even after losing the lawsuits AND after having a negative income for several years. Not sure how or why, but their pockets are deep, as are those at Accusis. Notice AlphaBest is on there and she SWEARS she does not send work to India. I worked there and i knew she did but she refused to admit it even though it is in writin now. My company does not offshore work, absolutely will not. We've actually gained/kept accounts assuring clients that we do not. We have many clients, cutting edge technology for both customer and employee, a healthy growth rate and a high MT retention rate. It's not impossible to have a successful USA-only based company. Sadly that may not be the norm anymore, but it's a choice MTSO/CEOs (whatever they may be) make and in my opinion maybe cutting some of the bottom line and offshoring is being done in place of producing a high quality of work that keeps a customer happy and not looking around for other service options. Subsequently I think these companies then suffer inferior work further because they are paying less and/or maybe have contractural obligations. Personally I'd like to think they'd still prefer high quality to low prices and inferior product. I have to wonder if these offshore companies are losing just as many accounts because of their product. I just know I am glad I work for a company who doesn't outsource, doesn't plan to, and has every intention to remain successful because quality does count. Boycott the BOS? Why not boycott the companies who offshore? Makes more sense to me. You have to admit when doctors say stuff they don't necessarily say/spell it right. It's your job to do so, and that includes producing a readable, understandable report that is uniform with those that are in use in whatever facility it goes to. If everybody did things their own way imagine what a mish-mosh of things would wind up in a patient's chart, not to mention there would probably be no end to made-up things or things inserted because it seems to fit. I wrote a letter to Hillary Clinton today, and I also wrote one to Mitt Romney. I am also going to write ANOTHER letter to the Editor as soon as I can compose my thoughts. Just think, if we ALL did this someone might say, well what's up with all this? and maybe we would eventually see a change. This didn't happen overnight and it won't change overnight. And it certainly won't change at all if everybody just sits around and complains. Strength in numbers, they say, and I'm sure we MTs are a large one. And I would type 40, three refills, I believe that's what the BOS says. I don't see it as particularly rebellious on your part. offshore overseas.... not outsource .... correct term is offshore. This seems to be pro-offshore board. Messages against offshore often just disappear. some from here on that emply the offshore MTs. Not to mention all the wonderful things AAMT is doing over there. offshore to India, it's OFFSHORE (off shore), not outsource to India. but that's to cover third shift. They have no intention of replacing their whole staff with offshore workers. There are things I don't like about the company but I believe them when they say that. They've been offshoring for years and have plenty of work for those who want to work in the US. Outsource is what hospital do when they send their dictation to a company such as Transcend or OSI. Offshoring is when they send their dictation to overseas transcriptionists. It is easy to confuse the two. They offshore, top pay is around 8.5 cpl. There have been several complaints the last couple of weeks about lack of work. Benefits are good. Don't know about platform. Check archives, lots about them lately. Diskriter and OSi also offshore. Rather than have new posters search through tons of archives for answers to this question, maybe a list should be made of all companies that do offshore and posted permanently on the board, with revisions made as new ones come up. Just a suggestion...please no flames! They have a facility in India. The fact that they offshore is all over this board. They have purchased several companies. I do not know if one of them is in New Jersey. We offer a choice of Domestic or Philippine based medical transcription services with U.S based Quality Assurance specialists, and 24-hour or STAT file turnaround.